There’s that famous scene in the music video for Bruce Springsteen’s Dancing In the Dark when a young Courtney Cox (of Friends fame) gets plucked from the audience to to dance on stage with the rock star.Well, replace Springsteen with Bryan Adams, and music video with real life, and you have what happened to a young Nepali banker on the weekend. When Bryan Adams rocked Kathmandu in Nepal’s first international concert Saturday night, it was neither his team members nor the three popular Nepali rock bands sharing the stage with him who shared the limelight. Instead, it was a 27-year-old budding banker who found herself a celebrity overnight with her face in the major newspapers Sunday. 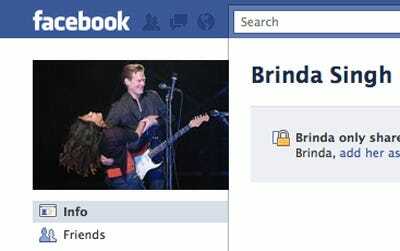 Singh has made a still of her and Adams together her Facebook profile picture, naturally. 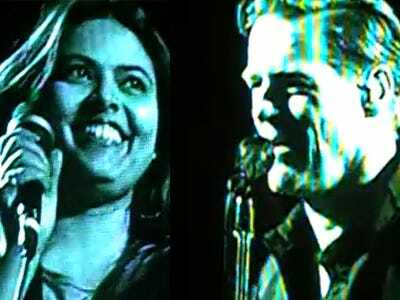 The woman is Brinda Singh, an executive with the Bank of Kathmandu.Adams told the 20,000-strong crowd he needed a lady to join him on-stage to sing his 90s hit, “Baby When You’re Gone,” which he sang with ex-Spice Girl Melanie Chisolm (aka Sporty Spice). Singh, who’d reportedly arrived at the stadium five hours prior to the start time to secure herself a good position, was the person on whom Adam’s eyes happen to fall. As it turned out, Singh’s father is a well-known Nepali singer called Bijay Singh Munal, and she’s been trying to break into the Nepali music industry for four years. She found a job in banking in the meantime. This was a huge concert and coup for Nepal: Adams is the first international performer to put on a concert in the embattled country.